It’s a common question, “What is the best way to projection map and sync multiple projectors?” If you have a large budget there are numerous ways; dedicated computers, media servers, bright signs, etc. But what if a $180 box could do just that? When the minds at Madmapper decided to make an installation companion for their software, they went with one of the most widely available computers on the planet; The Raspberry Pi. In fact, one artist had the same idea, but with screens instead of projectors. Christopher Meerdo of Chicago, IL, originally setup to sync 8 screens using the Raspberry Pi 3 platform and PiWall. Between, Nate, Chris & myself; we concluded that the latest beta version of MadMapper’s miniMAD sync was worth a try. 18 hours before the opening reception and we were configuring 8 miniMAD’s for 1080p synchronized video playback. Unlike the bright signs that require a configured script for sync, or the code based prompt of PiWall, the Madmapper software offers an easy to learn and elegant GUI interface. Configuring each screen as if it is a projector’s output gave us a live preview of the screen setup. We took all 8 of Chris’ individual 1080p video files, dedicated them to a single miniMAD & monitor, connected to an ethernet switch, and simply turned them on. The videos synced automatically and required minimal setup time. But these are 8 aligned LCD screens, what does this have to do with Projection Mapping? The original call came a week before the opening night. “How to projection map and sync 10 video panels split between 6 projectors.” At that very moment, I was testing the latest beta version of Madmapper 2.5 and reading about the new miniMAD sync script capabilities. The moment seemed too opportune to not grab 6 miniMAD’s and give it a go. 2 Days later and Ezra Masch’s “Stations” installation was up and running, providing 6 speaker surround sound through three of the Pi’s 3.5mm audio jack and 6 projectors with a built in feature set to live adjust the mapping with a wireless usb keyboard. Ezra’s piece makes use of 10 different video recordings by strangers using their cellphones pointed out the window of the 6 train in NYC. Walking into the installation is like walking onto a moving metro train itself. The bass from the subwoofer and surround sound system offer a complete audio/ visual experience. 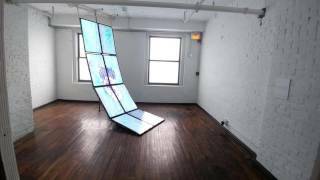 Watch the video below to see how it looks, the installation has been running since September. 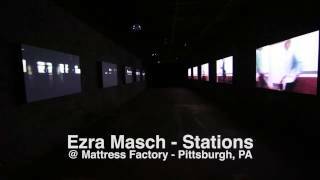 Ezra Masch Mattress Factory installation projection mapped layout.